This is a guest repost by Zoli Kahan from Clay.io. This is the first post in my new series 10x, where I share my experiences and how we do things at Clay.io to develop at scale with a small team. If you find these things interesting, we’re hiring – zoli@clay.io. Ansible has been our tool of choice for managing our servers. It’s simple enough for most developers to learn quickly and be comfortable working with, and has been critical for automating many of the processes normally managed by an operations team. GitHub – Great source code management, enough said. We currently use the official Docker registry to manage our docker containers. It’s similar to GitHub, except for Docker containers. While we are currently happy with our setup today, we hope to improve it in the coming months. This initial infrastructure version is missing some features which weren’t necessary enough to justify spending time on, but we will eventually need to come back to them as we scale. 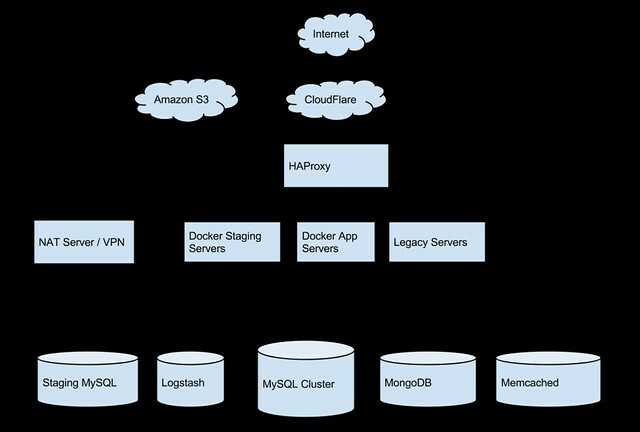 Kubernetes is looking to be an amazing project and tool for managing Docker containers at scale. We will be following it’s development closely and hopefully put it into production as the project matures. RethinkDB, while quite immature, is also quite an interesting project. We will definitely be following it’s progress and may eventually move some of our data into it as we move away from MySQL.